Spirits producers are keen on helping their surrounding community. Here are seven bottles you can feel good about drinking. There’s never been a better time to lift a glass to help a favorite charity. Purchase any of the following spirits, which include some new releases for 2019, and the producers will donate proceeds to benefit a wide range of charitable causes. Mix rum-soaked tiki drinks to help out hurricane survivors in St. Croix, sip a Kentucky whiskey that raises funds for amyotrophic lateral sclerosis (ALS) research, or pour a potato vodka that donates meals through hunger relief organizations. Here are seven bottles to help make your next drink count for a cause. Bittermens says that 50 cents from the sale of each bottle of its New Orleans Coffee Liqueur is donated to a rotating selection of New Orleans and/or Louisiana charitable organizations. “We thought that if we’re going to use New Orleans in the name, then we want to give something back to the city,” the producer says on its website. In 2018, the initiative raised funds for the Southern Poverty Law Center. Bittermens says that previous beneficiaries included the Tipitina’s Foundation, SBP (St. Bernard Project), Grow Dat Youth Farm and Second Harvest Food Bank. This year’s charity is slated to be selected this summer. The distillery, based in Ukiah, California, part of Mendocino County, says it will spotlight one of its whiskey bottlings to benefit victims of recent California wildfires. Charbay will release a specially labeled bottle of its current R5 whiskey, distilled from Racer 5 IPA by brewery Bear Republic, and has already committed to donate $10,000 to Stand for Kindness, a nonprofit vehicle for relief donations. Jenni Karakasevic, Charbay’s director of operations and owner, holds the same titles at Stand for Kindness. New Hampshire-based Tamworth Distilling says it will donate $1 from the sale of each bottle to the Chocorua Lake Conservancy. The charity, which was founded in 1968, protects the scenic and natural resources of the Chocorua Lake Basin and surrounding area. The whiskey is made from a single crop of organic rye grain, grown in Maine, that’s distilled in the sour-mash style and aged more than two years in white oak barrels. The initiative, which aims to support the upkeep of the Chocorua Mountain in New Hampshire, was announced in September 2017. This is a gold rum bottled at 137 proof, an acknowledgement of the wind speeds of the Category 5 hurricane that swept through Cruzan’s native St. Croix in 2017. For each case sold, Cruzan plans to donate $1 to the Island Spirit Fund, which benefits communities impacted by hurricanes across the U.S. and its island territories. Cruzan is a founding sponsor of the fund. The rum bottling launched in November of last year, and by the end of 2018 the company says the initiative raised more than $925,000. Each year, Heaven Hill releases a special whiskey in the name of its late master distiller, Parker Beam, who died of ALS, commonly known as Lou Gehrig’s disease, in 2017. The company donated proceeds from last year’s edition, a Bourbon finished in orange Curaçao barrels, to ALS research and treatment organizations like The ALS Association. Collectively, the company says bottle sales from the series, which began with a release in 2013, have raised about $920,000 so far for ALS research and treatment. 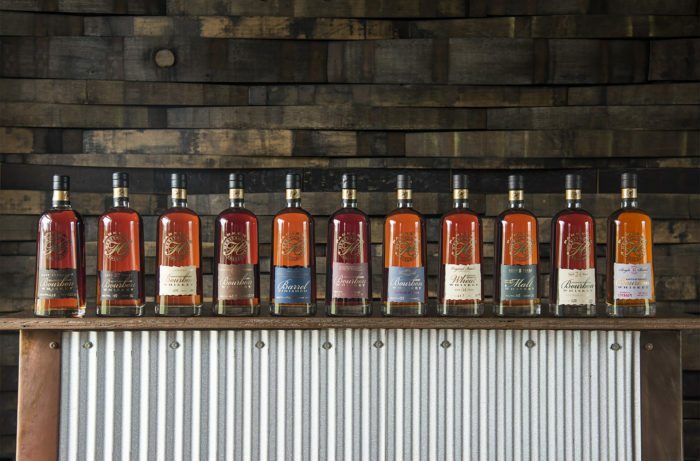 The 2019 edition, scheduled to be released this fall, will be the 13th bottling in the series. Details aren’t yet available, but the limited-edition whiskies are different each year and often become collectors’ items. We’re especially fond of the 2015 edition, an eight-year-old Kentucky straight malt whiskey. Made with Idaho potatoes, this producer says it donates 20 meals per bottle produced through partnerships with local and national hunger relief programs. Simple notes the Houston Food Bank as a recent beneficiary. Since its launch in 2017, Simple says it has donated more than 600,000 meals and aims to reach 1 million meals in early 2019. Based in Nelson County, Virginia, this whiskey producer releases an annual “charity cask” to benefit a different local organization each year. The limited-release bottlings are made in collaboration with other local producers. For example, last year’s whiskey rested in a coffee-soaked cask, a collaboration with Charlottesville cold-brew coffee company Snowing in Space, which gave the spirit a subtle, enticing mocha aroma. The company says the bottling raised $5,000 for the Almost Home pet adoption center, which was selected via a public vote on social media channels. Virginia Distillery says the runner-up from that vote, the Nelson County Food Pantry, will be the beneficiary of this year’s Charity Cask. The barrel finish for that bottling will be selected in mid-to-late February.